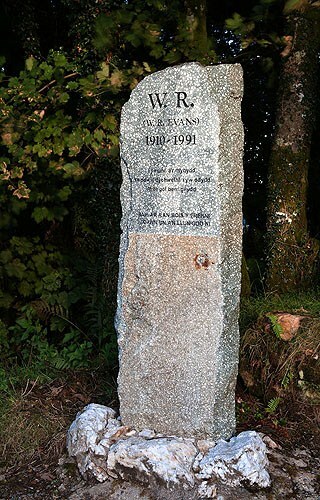 A short distance from Cerrig Meibon Arthur, at the entrance to Glynsaithmaen farm , is a modern monument (2m) of partly polished Preseli Bluestone ,with an inscription in the polished area to William Rees Evans (1910-91) poet and song-writer. Glynsaithmaen (the valley of the seven stones), the best known Standing Stones being Cerrig Meibon Arthur(2) and the Gate Stones(3) . W R Evans was born in this farm . He became well-known throughout Wales as the compere of 'Bois y Frenni' a form of concert party originally formed to entertain audiences during the Second World War , which still performs regularly. I will return one day as dust to be one with the mountain. He stands on behalf of the boys of the Frenni as a tribute to the talent of one who created us.